The Norway Marco Polo Handbook offers expert advice and is aimed at travellers looking for in-depth coverage of a destination - from detailed cultural information to Insider Tips - in an easy to use format. Whatever your mood or interests, Marco Polo Handbooks are the perfect travel companion. Land of the Fjords: Let Marco Polo lead you into a land full of natural wonders, with its deep blue fjords and its fjells, thundering waterfalls, scenic sunny beaches and deserted mountain areas where you can go on the trail of the muskox and the elk. Discover & Understand: Our innovative infographics condense large amounts of information into a format which is easy to understand. Infographics illustrate, amongst other things, Norway at a glance, the North Sea oil and gas industry and the rhythm of the local wildlife. In the mood for: Fun suggestions help you to experience the variety of Norway, whatever your personal preferences and interests. 3D images provide vivid insights into selected structures such as the Oseberg Ship and the Heddal Stave Church. Tours: Discover Norway! Four exciting tours reflect the many sides to the country. Discover some of Norway's most beautiful beaches and coastal towns on the tour from the southern tip to Telemark, or travel north right along the coast from Norway's southernmost point. Explore the North Cape or embark on a spectacular journey through the wild heart of the country. All suggested tours are plotted on detailed maps and combine the best and most interesting places to see, with tips for exciting stops along the way. Experience & Enjoy: All the things which make a trip unforgettable: from eating and drinking, shopping, sightseeing, museums & galleries, staying the night, travelling with children, festivals and going out in the evening. What are Norway's typical dishes and where can you sample them? What is there to do with children? Answers to these and many other questions can be found in this chapter. In depth knowledge: Knowledge is king and Marco Polo Handbooks are packed full of information to help you get the best out of your trip. The Marco Polo Tips reveal where you can go on muskox safari, where you can complete four hikes in one go, and where you'll find Ibsen's local pub. Large pull-out map: Includes a separate pull-out map handily placed in a high quality plastic wallet at the back of the book, which can also be used as a storage pocket. Marco Polo Travel Publishing offers a wide range of high quality cartographic products and travel guides. 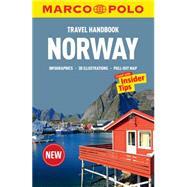 Marco Polo Pocket Guides are known for their handy, compact format and Insider Tips. Our Travel Handbooks are the first to include infographics and our Spiral Guides feature unique lay-flat spiral binding. Marco Polo Maps are famous for the high quality of cartography in their Country, City and Holiday Maps.